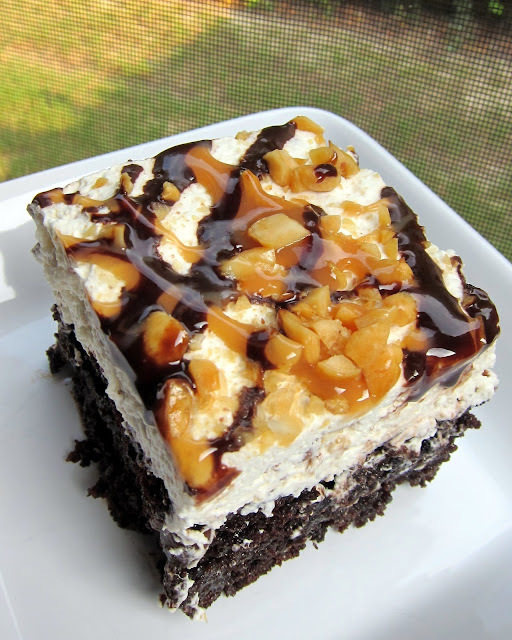 Snickers Poke Cake Recipe - chocolate cake, caramel, whipped cream, peanuts and chocolate sauce - OMG! There is NEVER any left! People go nuts over this cake!! If you follow me on Twitter or Facebook you already know about this cake. I made this cake for Chicken Legs birthday this past weekend. He actually came up with this cake and I baked it for him. This cake was over the top! It is similar to some of the other candy bar cakes we've made recently, but on steroids. This cake was actually better the second day (if you can wait that long). Be warned - this is super rich. Make sure you have plenty of people to share it with! i think i just gained 10lbs from looking at it! oh my gosh it looks oh so good!!! Oh..My...Lord..... MUST have. you rock! My husband would luv it. His favorite candy bar is snickers. Oh my goodness, I can't wait to try this! IT looks YUMMY! Thanks for sharing the recipe! HUGS! Made this for my son's girlfriend for her birthday this weekend. It was a HUGE hit. Will be trying this out with other candy bar/cake mix combos. The icing made with heavy cream is really the perfect topping. Thanks for sharing your recipe. That looks incredible. I have a major sweet tooth so I'll have to try sometime this summer. I was wondering about Sunday Dinner dessert--well, I'll wonder no longer. This will be an amazing surprise to those lovlies who gather around my table! Made this for July 4th party and it was a hit! im becoming the "cake lady" in the family. ill have to try all your cake recipes now so i dont have repeats unless requested! I hope it isn't too late to ask a question but are you supposed to heat the caramel ice cream topping before mixing or is hot just part of the name? I have to say...you are my hero! I just finished making this cake for my husband's birthday, it looks so yummy! It is in the fridge taunting me right now. Next time (yes there WILL be a next time) I need to whip the cream longer to make it fluffier, I was afraid of turning into butter. It still turned out fluffy but not as fluffy as yours. When the recipe calls for vanilla...is it extract? Daysi - yes, it is vanilla extract. I hope you enjoy the cake! how much Smucker's hot caramel ice cream topping do u use as far as cups/oz? Ginger - you use the whole jar. I believe it is 12 ounces. I bought a small carton of heavy whipping cream and mixed it with the powdered sugar on high with the standing mixer. It never got fluffy :( it was runny, thin liquid. What did I do wrong? I ended up buying a tub of cool whip which saved me. Everyone loved it, regardless. I just tried making this cake and it was a bust. The caramel milk topping flooded, softened and destroyed the soft cake. I want to try this again in the morning. Questions: I leave the cake in the pan when I pour the Carmel milk topping over the holes? How many holes? Cause when I poked them it started pulling some of the cake up. Is the cake in the pan or on the cooling rack when I frost it? Just made this for work birthday party and it was a huge hit! This webpage is now being distributed around the office! Caroly - YAY! So glad it was a hit and thanks for sharing the link to the website! just made this for myself for my birthday. Amazing and delicious. Just made this. I've never had a recipe turn out just like a picture until now. My family LOVED it too! Thanks!!! That is awesome Stephanie! Glad it was picture perfect! 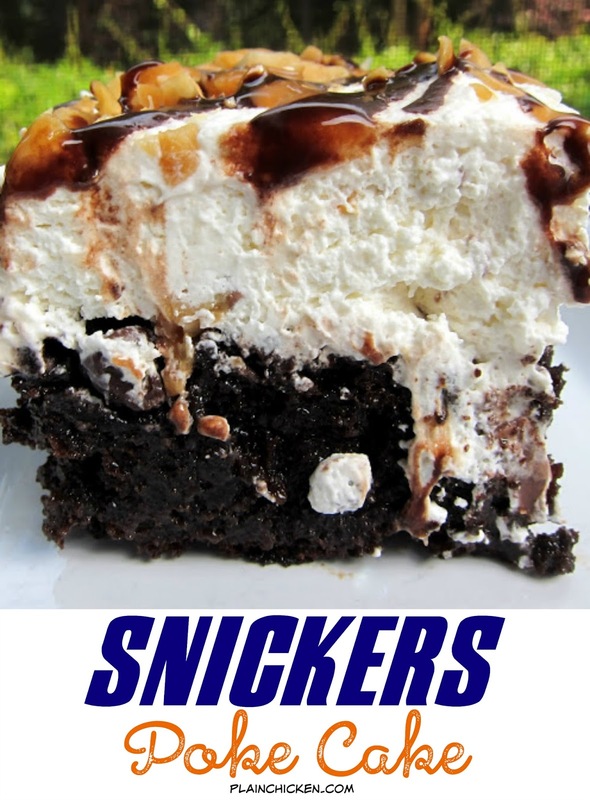 I see a lot of snickers cake recipe but this one is unique. Can you make recipes for diabetic people too? I didn't read the pour the condensed milk part while cake is hot part. my cake is cooled already.I wonder if i can poke holes now and if it.will still soak it up? Fn - I think it will be fine. It just might take longer. If this is your original recipe...you should know someone is taking your photo and recipe and spreading it around facebook (a copyright violation that's been happenign with increasing frequency)...I just happened to see a friend share it and wanted ot make you aware of it. Sarah - thank you SO much! It is my original recipe and photo. I really appreciate you alerting me to this violation! O M G!! This cake was Amazing!!! I am on my second cake because it went so fast! I have become addicted to making your recipes..I am doing the Butterfinger Cake as we speak!!!! Ty for posting these amazing recipes!!! I’m a frustrated pâtissier! I want to learn this recipe for my mother. 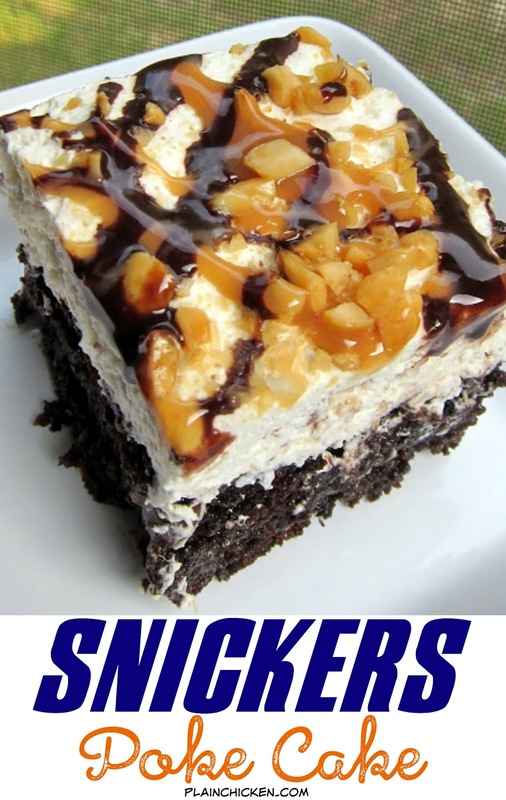 She loves snickers chocolate so I guess she will probably like this snickers cake as well. Terrific recipe! It not only looks fantastic, it appears to be pretty easy. But I do have a question. You say to use three Snicker's bars. Since they come in so very many sizes (mini, fun size, regular, king size, etc. ), which size do you recommend for a 9x13" cake? I'm assuming it's the regular size ones, but I thought I'd check. Thanks so much for the post, along with your many other wonderful recipes! CBinLB - I did use the regular size snickers bars. Enjoy! How much sweetened condensed milk did u use? How long will whipped cream hold up after being made? Sheryl Lynn - it will keep at least 2-3 days. I never have any cake after that. Do you whip the whipping cream first then add the powdered sugar & vanilla or do you mix all 3 together at once? Shelly - I whip all three together at the same time. Enjoy! It was a complete hit!! Thank you so much!!! I am sure it will be made many times. I have a question. It says to add the condensed milk and caramel and let it cool. Then it says to add the chocolate chips. I just want to verify that you add the chocolate chips once the cake is completely cooled, and not beforehand. I'm just uncertain if the chocolate chips are supposed to melt and add a layer of chocolate, or if they are to remain solid and add texture. Can you please advise? Thanks!! Brenda - I put the chocolate chips on after the cake cooled. I wanted them to be firm and not melted. Enjoy! Great. Thanks sooo much!! I can't wait to try this cake...baking it as I type. Absolutely great recipe!! Made this the other day for a Pinterest party and it received rave reviews. I agree that it is better the next day even. But, still very good the same day.